ChemElectroChem a top-ranking electrochemistry journal for primary research papers and critical secondary information from authors across the world (ISI Impact Factor 2016: 4.136). The journal covers the entire scope of pure and applied electrochemistry, the latter encompassing (among others) energy applications, electrochemistry at interfaces (including surfaces), photoelectrochemistry and bioelectrochemistry. ChemElectroChem is published on behalf of ChemPubSoc Europe. 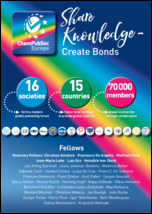 The ChemPubSoc Europe family comprises: Angewandte Chemie, Chemistry–A European Journal, European Journal of Organic Chemistry, European Journal of Inorganic Chemistry, ChemPhysChem, ChemBioChem, ChemMedChem, ChemCatChem, ChemSusChem, ChemPlusChem, ChemElectroChem and ChemistryOpen. ISSN: 2196-0216 (online). CODEN: CECHFT. Volume 4. 12 Issues in 2017.